Selenium atoms have 34 electrons and the shell structure is 2.8.18.6. The ground state electronic configuration of neutral selenium is [Ar].3d10.4s2.4p4 and the term symbol of selenium is 3P2. Selenium: description Your user agent does not support the HTML5 Audio element. Selenium can be prepared with either an amorphous or crystalline structure. Crystalline monoclinic selenium is deep red; crystalline hexagonal selenium, the most stable variety, is a metallic grey (see picture above). Elemental selenium is relatively nontoxic and is considered to be an essential trace element. However, hydrogen selenide (H2Se) and other selenium compounds are extremely toxic, and resemble arsenic in their physiological reactions. Hydrogen selenide in a concentration of 1.5 ppm is intolerable to man. Selenium occurs in some soils in amounts sufficient to produce serious effects on animals feeding on plants such as locoweed (an American plant) grown in such soils. 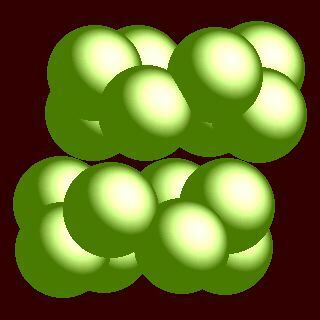 The solid state structure of selenium is: bcc (body-centred cubic). Selenium is essential to mammals and higher plants, but only in small amounts. Selenium is said to stimulate the metabolism. It may help protest against free radical oxidants and against some heavy metals. Livestock grown in areas containing high amounts of selenium in the soil and in which a plant called Astragalus ("loco weed" in USA) is present are poisoned. This is because Astragalus concentrates selenium. On the other hand, sheep grown in areas containing deficient amounts of selenium in the soil develop "white muscle disease". Reactions of selenium as the element with air, water, halogens, acids, and bases where known. Binary compounds with halogens (known as halides), oxygen (known as oxides), hydrogen (known as hydrides), and other compounds of selenium where known. Bond strengths; lattice energies of selenium halides, hydrides, oxides (where known); and reduction potentials where known. Selenium was discovered by Jöns Berzelius in 1817 at Sweden. Origin of name: from the Greek word "selene" meaning "moon". 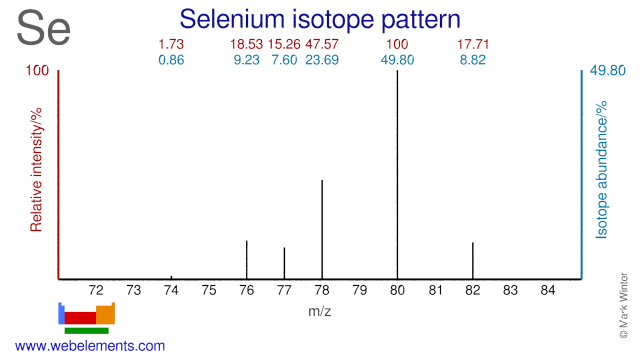 Isotope abundances of selenium with the most intense signal set to 100%. Isolation: it is not usually necessary to make selenium in the laboratory as it is commercially available. While there are several selenium ores, most selenium is made as a byproduct of copper refining. It also accumulates in the residues from sulphuric acid manufacture. Extraction is complex since the method emplyed will depend upon what other compounds or elements are present. The first step usually involves an oxidation in the presence of sodium carbonate (soda ash).